Obituary – Branen, Sherman Monroe « Perry High School Alumni Association, Inc.
Class president ’23, Editor-in-Chief Peroma ’23, Basket Ball ’21,’22,’23. ﻿Sherman Branen, 91, died at 12:50 p.m. Saturday, Nov. 26,1994, at Perry Green Valley Nursing home. Graveside rites are set for 10 a.m. Tuesday at Grace Hill cemetery. Rev. Lynn Scott, pastor of the First Christian church, will officiate. Arrangements are under direction of Brown Funeral home. Branen was the son of James Monroe and Josie Alice Branen and was born in rural Logan county, near Tohee. The Branen family moved to Perry in 1919. 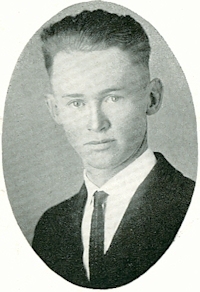 Branen graduated from Perry high school in 1923. 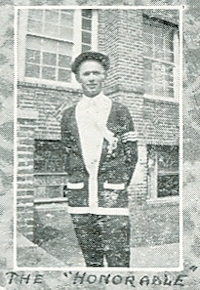 He was president of his senior class and served as captain of the school’s basketball team. He attended Cope Electrical School in Chicago, IL., then was employed as a wire chief for Southwestern Bell Telephone. Branen and Wilkins Smith were married at Perry on March 8. 1927. Mr. and Mrs. Branen later moved to Cushing. He was employed as an electronics technician in the communications division of Conoco Pipeline. He was an active amateur radio operator for a number of years. Branen and his wife later lived in Louisiana and Texas. Following his retirement in 1968, they moved back to Perry. Mrs. Branen preceded her husband in death. Survivors include one sister, Faythe Berglund, Ponca City: and several nieces and nephews.